BlogHer is done and over with for another year and that means for at least the next week or so the blogosphere is going to be saturated with BlogHer wrap up posts, pictures, and more tweets about how everyone is missing each other. I am no different than all the others and am jumping on the bandwagon. 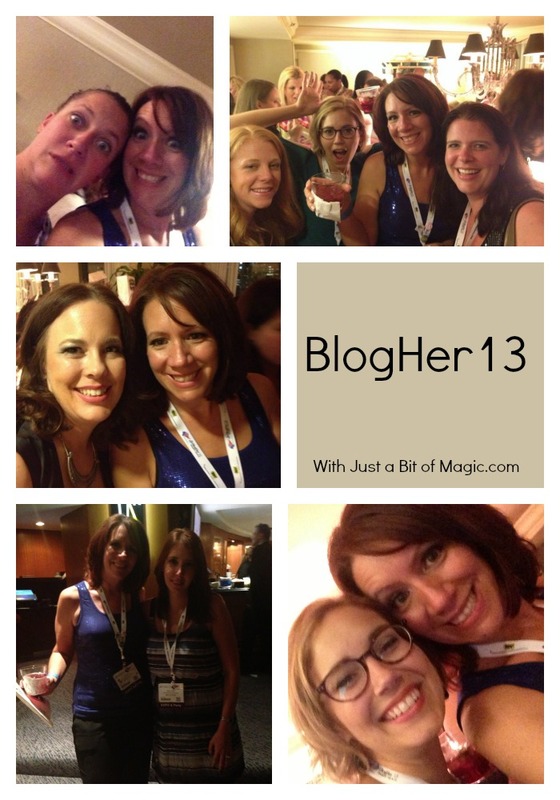 So was my first BlogHer everything that I could have ever wanted it to be? eh… sure. It was really good but I missed out on the keynotes, VOTY awards, and the sessions and that was my own fault because I didn’t get a full conference pass. It’ll be okay though because now that the sessions are being transcribed and posted on the BlogHer site I can read through them at my own pace. There are a few things that I did learn though. First of all the conference really solidified how much of an introvert I really am. I mean geesh… I spent so much time worried about being the annoying person that didn’t have friends that I didn’t just walk up to groups of people and talk to them. I tended to keep to myself more than I should have and I think that hurt my overall experience. On the bright side I met just about everyone on my list of must meet people as well as so many other wonderful people. There were smiles, laughter, and lots and lots of hugs. I felt like I belonged and accepted to a special group of people. I was with friends and it was amazing because these people who I have “known” and chatted with for the past three years were with me in person and the best part… these women were no longer just my friends in the computer, they were my real life friends. Did I mention that there was lots of hugging? What about the squeeing? Well, there was a lot of that too. 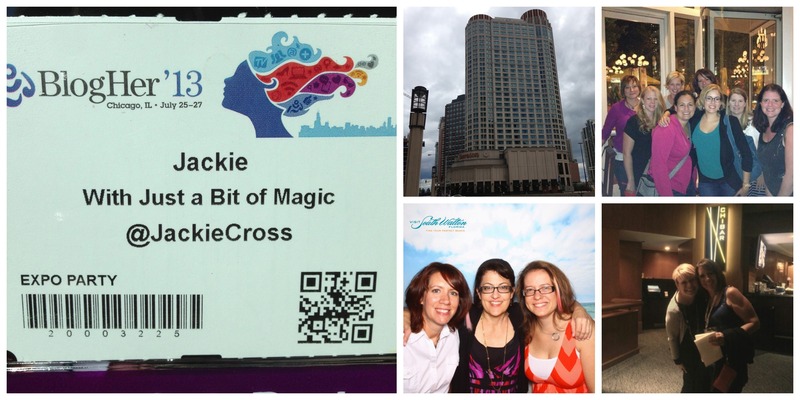 The first day that I arrived in Chicago I met up with an amazing group of women…. there had to be close to 20 of us there at lunch. Most of them I had met through blogging and others were totally new to me. Regardless, I was met with smiles and hugs… I felt totally welcomed to the group. The rest of the weekend was much of the same. My biggest regret? Not taking enough pictures! When I was going through my phone looking at the pictures I did take I realized that there weren’t that many and I didn’t get pictures with everyone! Another thing that I learned was actually before the conference began. The women who were once just online friends are open, honest, and trusting… we swapped phone numbers without a second thought and almost immediately started talking to one another. And we are still talking. I’ve found my ‘tribe’. The group of bloggers who I trust completely and would help out in anyway that I could if they asked. They’re women that I could sit up talking to late at night sharing silly stories, laughs, serious conversations, and more. I made connections that I value greatly and they’re connections that I will continue to maintain and grow because aside from simply being a connection they’re friendships and that is more important. It’s Wednesday and because of that I’m linking up with Shell for Pour Your Heart Out and Angie & Amanda for Wordful Wednesday. What’s really exciting… this is the second time that I’ve been featured on BlogHer! The first was back in Novemeber about a soldiers homecoming. I was shocked when I got the email on Thursday because the post that they’re featuring is one that I just posted on Tuesday this week. Did you see it? How to prepare for becoming a parent… there are 15 simple steps that one needs to follow and then they’re all set to become a parent. Trust me these are easy peasy and very true. Anyway, I love that they noticed it and are featuring it… to me it’s a huge honor. Anyway, check out my feature on the front page of BlogHer it’s in the BlogHer Moms topic section and let me know what you think. Really… please come talk to me! I look scary… I’m not I promise. I’m just not super outgoing. I love reading. There’s no doubt in my mind really and when I find a good book I get pulled in and find it hard to set it down. Then, of course, there are times when I start a book and just get stuck. I can’t seem to get into the book and find myself forcing myself to read it because I may finally break through the slowness and get to the good parts. Sometimes it gets better and other times… well, I just set it aside for a while. I just finished reading Matched and I’ll be honest with you, it started out pretty slow. I had a hard time reading it. Part of it was because I was angry. The book is set in the future and it’s a future where the officials (government) control almost everything that the population does. What they eat, when they eat, what job they get, who they marry (if they even can), how many kids they have, and when they die. Every bit of life was controlled by the officials and everyone believed that it was for the best. Matched. When teens reach the age of 17 they attend a banquet where they are matched up with the person they’ll spend the rest of their life with. It was hard to not be happy for Cassia when she was matched with her long time friend Xander. But yet, I found myself annoyed with the Officials and all of their control and reading it was slow because of that I think. I pushed on though and the book did get better. Other characters are introduced and fleshed out as the book continues. Ky, Cassia’s love interest being one of the most important. Of course there’s a hint of rebellion, and as always a bit of foreshadowing of future stories. Anymore and I will end up giving away the entire story! In the end I found myself liking it more and more and wondering what happens next, what will Cassia do or say, what new twist will the officials add to the story, and how will all tie together. Could you live in a world where everything is decided for you… where you have no control? Could you have faith in a world controlled fully by the government? If you want to learn more about the author, Ally Condie, check out her Facebook page, Twitter, and of course her blog. Join me in discussing Matched over at BlogHer Book Club page! This week’s BlogHer’s Living Life Well Lived question was one that made me think…..
How do you incorporate color into your look? Color! Me… After I read the question I realized that I have the most boring closet full of clothing ever. I mean it’s full of black… dark colors… blah! Boring. For a bit I thought maybe I was living in an old black & white tv show with all the black & neutral colors in my closet. Honestly, it’s something that I’ve really been noticing since spring has started. I didn’t want to wear the dark colors anymore because I wanted something more… something that popped…. something that said spring! Buying an entire new wardrobe is out of the question, but after poking around some more in my closet and jewelry case I was able to come up with a few ways to brighten up things. I’m sure that there a tons of ways that you can incorporate color into your look and have fun with your wardrobe now matter what season it is! Then again I’m all for going shopping and finding some great new outfits! When you’re done here why don’t you head on over and join me in the conversation on BlogHer! Oh! And while you’re there don’t forget to enter Life Well Lived Sweepstakes where you could win an iPod Touch and a $50 gift card to iTunes! A memoir… a written account of ones life. A biography. I love reading but I’ve always stuck with fiction, only reading biographies when they were assigned in class while in elementary school. I don’t know why it is, I guess I thought they were boring… slow… or just not interesting. 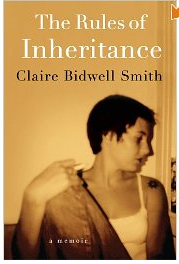 The Rules of Inheritance is an incredible piece of work that once I started I couldn’t put it down. It was the most gripping memoir and had me in tears more than anything I have ever read. Claire’s story is a sad one as she recounts her life, her parents lives & their suffering from cancer and Claire’s struggle with her own grief. I have never read something so powerful and deeply touching and knowing that this wasn’t fiction made it even more impressionable on me. I love how the book was written in a non-linear fashion and followed five stages of grief; denial, anger, bargaining, depression and acceptance. The non-linear fashion could confuse some people and I’ll admit at first I was a bit lost but the more I read the more it became a natural flow for the book. Her grief was so strong and led her to a destructive lifestyle I was amazed that nobody in her life stood up and tried to help her… maybe they did or possibly she just didn’t let anyone that close to her. From bad relationships to the constant drinking to help numb the pain I kept hoping that the next page would bring happiness and relief into her life. And soon enough it did. I’ll stop here so I don’t give to much away and urge you to go out, get the book and read it for yourself. I know that you’ll love it as much as I did. If you’ve already read the book or want to know more come take part in the conversation over at BlogHer. This is a paid review for BlogHer Book Club but all opinions expressed are my own. With the holiday season fast upon us family gatherings, office parties and other celebrations with family and friends will soon occupy a lot of our time. This can be a stressful time of year and even more so when you have divorced parents, are divorced your self, or worse yet both! Coordinating all the events could give even the best planner a run for their money! But what can you do to get through the holiday season without causing harm to one of your family members or going absolutely insane? Yes, I know what you’re thinking…. Wine! Lots and lots of wine. But in all seriousness there really are a few things that you can do to survive the holiday season! Just roll with it – Yes, you heard me. Don’t let things get to you otherwise you’ll end up getting stressed out. If you know that the holidays with your in-laws is a rough time then prepare yourself in advance and just let things slide, because it’s only one day and then you can go back to your own home and relax. Stay home – I know it’s radical but if you have to do it then stay home and do what’s best for you and your family. Me time – I think that this is an absolute must. Take time for just you whether it’s reading a book, taking a long hot bath, or get out for a cup of coffee with a girlfriend. Don’t have the party at your house – for me this causes more stress on myself and my immediate family because of all the work that it involves and the stress of making sure that everything is perfect. Let someone else throw the party and you just go and enjoy it. I know that I’ll be taking some of my own advice this year! With at least 4 family gatherings to attend this holiday season I’ll need some me time at home… with a glass of wine! So how do you survive the holiday season with your family? Join the conversation on BlogHer and share your thoughts with everyone and while you’re there enter to win the $250 sweepstakes! On Thursday something happened that I never thought would happen to me. My content was stolen. I always thought why would someone take my stuff? It’s not that good. Seriously. But it happened. Not once, but twice in the same day and then it got me wondering how many other times has it happened that I don’t know about. How many times has this happened to other bloggers out there and how many of them don’t even know it. When I found out I was shocked. Annoyed. Angry. I wanted to do everything I could to get my content removed from those sites. I spent the better part of the afternoon working on it and with the help of some wonderful people and one in particular, Ashley, I was able to start making some headway. Alright, I’m going to share with you a few things that I found out. Look at your spam comments because that’s how I found out. There were trackbacks in there that needed to be approved and I didn’t recognize the sites so I checked them out first. Both sites grabbed my entire post… images and all… and had a link back to my blog at the end of it (this doesn’t make it right). Copyright your content! I use a service called My Free Copyright and ever post I make is copyrighted. I get an email that I save for each post. By registering you get a public record of all your content that is saved on their databases. If you find that your content has been stolen then contact them and tell that you want it removed. Don’t ask. For me I went around in circles. For the first site I found I found who was hosting it, called them, and was told to email their copyright claims department. Which I did. I then found out that they don’t really host that site so I was pretty much out of luck. Find information on some sites that steal content is like finding a needle in a haystack. There is nothing on them! No about, no contact, nothing. Sites that are hosted by WordPress.com seem to be harder to turn in. I’m still working on that one! Now I’m not going to go into everything that I learned. Instead I’m just going to share with you all the links that were shared with me. Lorelle on WordPress has a lot of great information and even more helpful links. Problogger, of course, has a list of his own. BlogHer also shares some tips on protecting your content. I hope that this never happens again and I hope that it doesn’t happen to you either. It’s wrong for anyone to take your content that you worked so hard on, something you put your heart & soul into. As a BlogHer Book Club member I recently read the new novel by Tana French, Faithful Place, and I have to say that I was impressed and I think you will be too. From murder, to dysfunctional families, and mystery you’ll find almost everything in this book! Take a few minutes and head over to BlogHer and check out my review of the book and let me know what you think. Comments are of so you can head over to my review and leave your thoughts there!